Without positive attitudes and perceptions, students have little chance of learning proficiently, if at all. There are two categories of attitudes and perceptions that affect learning: (1) attitudes and perceptions about the learning climate and (2) attitudes and perceptions about classroom tasks. A basic premise of the Dimensions of Learning model is that effective teachers continually reinforce attitudes and perceptions in both these categories. The master teacher has internalized techniques and strategies for enhancing these attitudes and perceptions to such a degree that the techniques are frequently transparent: they have become part of the fabric of instruction and are barely noticeable to the undiscerning eye. To illustrate, let's consider Mrs. Salley's class. Although this scenario might give the impression that Mrs. Salley was dealing with peripheral issues before she got down to the business of teaching, she was actually setting the stage for learning by attending to specific attitudes and perceptions that affect the learning climate and classroom tasks. Mrs. Salley was dealing with the learning climate when she greeted students at the door, organized them into cooperative groups, and discussed and revised the two classroom rules. And she was attending to attitudes and perceptions about classroom tasks when she provided students with a model of what the successfully completed task might look like. She was also attending to attitudes and perceptions about classroom tasks when she told students that even though the task might look difficult, they had all the skills and abilities necessary to complete it. The relationship between attitudes, perceptions, and learning is complex. As the above scenario illustrates, however, there are two very general areas on which a teacher can focus with the confidence that her efforts will reap rich rewards. During the 1980s, the amount of research on the role of classroom climate in the learning process increased tremendously (e.g., Brophy 1982, Fisher and Berliner 1985). Within that body of research and theory, climate was conceptualized in terms of factors external to the learner, such as the quality and quantity of the resources available, the physical environment of the classroom, and so on. More recently, psychologists have begun to view classroom climate more as a function of the attitudes and perceptions of the learner than of elements external to the learner. If students have certain attitudes and perceptions, they have a mental climate conducive to learning. If those attitudes and perceptions are not in place, learners have a mental climate not conducive to learning. In general, two types of attitudes and perceptions affect learners' mental climate: a sense of acceptance and a sense of comfort and order. Intuitively, we know that learning is inhibited if students do not feel accepted by the teacher and by their peers. You may recall a time in elementary school when you did not feel accepted by your peers, or a time in college when you felt that a professor did not respect you. In both cases, these perceptions probably distracted you more than a little from learning. Researchers confirm the importance of a sense of acceptance. Tom Good and his colleagues (Good 1982, Good and Brophy 1972) have illustrated the importance of students' perceptions of their acceptance by the teacher. Similarly, for decades Arthur Combs (1962, 1982) has championed the importance of students' perceptions of their acceptance. By making eye contact with each student in the class, being sure to pay attention to all quadrants of the classroom. By calling all students by their first or preferred name. By deliberately moving toward and staying close to learners. By touching students in appropriate and acceptable ways. Overtly planning for and using these and related behaviors can help students feel accepted and can also foster teacher insight and awareness. For example, a secondary science teacher once told me that after trying to give eye contact to students in each quadrant of the classroom, she realized that she always avoided looking at students in the left back section of the room. She wondered aloud if she had been doing this all through her fifteen years of teaching and said that if she had, she felt sorry for the hundreds of students who had sat in that part of the room. Providing wait time—pausing to allow a student more time to answer instead of moving on to another student when you don't get an immediate response. Dignifying responses—giving credit for the correct aspects of an incorrect response. Restating the question—asking the question a second time. Rephrasing the question—using different words that might increase the probability of a correct response. Providing guidance—giving enough hints and clues so that the student will eventually determine the correct answer. Again, these actions may seem insignificant, but they send powerful messages to students. One teacher told me that she never realized the extent to which she was communicating a lack of acceptance of her students until she began monitoring her responses to their incorrect answers. She found that her usual response was to immediately move on to another student until she received the correct answer. She concluded that her behavior during questioning had highly negative overtones that probably made students reluctant to answer her queries. Students need to feel accepted by their classmates as well as by their teacher. Although this need has been popularized in recent years through the cooperative learning movement, its importance has been recognized for decades in the research on the social aspects of learning. According to Slavin (1983), research on the utility of cooperative learning was already well developed by the 1920s. From his review of the literature, Slavin has concluded that the positive effects of cooperative learning on academic performance are not well established, but its effectiveness in fostering acceptance and understanding among the members of a group is undeniable. The most popular model of cooperative learning is probably that developed by Roger and David Johnson (Johnson, Johnson, Roy, and Holubec 1984). In their model, they stress that “individual accountability” and “positive group interdependence” are key elements of cooperative learning. Neither of these dynamics occurs naturally. Teachers have to structure tasks to create individual accountability and group interdependence, usually by asking each group member to be responsible for a different aspect of a task. For example, one member might be responsible for gathering information, another for organizing the information into a cohesive whole, another for orchestrating the best way to report the information, and so on. Individual accountability and positive group interdependence are also fostered by asking students to assume different interaction roles, such as facilitator, recorder, and reporter. It is these very dynamics of cooperative learning that increase the probability of acceptance among group members. Slavin (1984) notes that this probability is heightened when teachers structure cooperative tasks so that groups are mixed in terms of ethnicity, gender, and ability. The orientation of the meeting is always positive—that is, toward a solution rather than toward fault finding. Obviously, many problems do not have a single answer. For example, in the case of coping with a bully, the solution is often in the class discussion itself (Joyce and Weil 1986, p. 207). Feeling accepted is an important aspect of a positive learning climate. The formal and informal techniques described above can help teachers create this environment. How to arrange desks and other furniture. When to take breaks and what kind of breaks they will be. What to display on the bulletin boards and walls. Presumably, allowing students to make these kinds of decisions keeps in check the teacher's natural tendency to organize the physical environment in a manner that is comfortable for her but not necessarily for her students. Another important aspect of a sense of comfort is the affective tone of the classroom. Research by Mandler (1983) and others (Santostefano 1986) indicates that a positive affective tone is generally conducive to learning. Most teachers foster a positive affective tone by capitalizing on the lighter side of instruction and even building levity into their daily routine. For instance, I once observed a secondary teacher who had been described to me as “the best of the best,” and within five minutes of the start of her class, I found myself laughing. When I reflected on my notes to identify the factors that made her the “best of the best,” I concluded that she not only knew the content well and presented it clearly, she also quite consciously got students (and myself) laughing and maintained the jocular tone throughout the lesson. In retrospect, I saw that I had learned a great deal and had fun doing it. Until recently, little attention has been paid to the importance of positive affect in teaching, but the clinical work of Roger Mills and his colleagues (Mills 1987; Mills, Dunham, and Alpert 1988) has illustrated its central role in learning. Basically, Mills asserts that our affective state at any point in time colors our cognition and behavior. The highest affective state is joy or happiness, and Mills asserts that teachers should overtly attempt to bring about this state whenever possible. Teachers who have for years used humor as a part of their instructional repertoire can take pleasure in knowing that they have been capitalizing on a basic principle of human behavior to enhance student learning. Order also refers to the perception that the learning environment is safe. Although Maslow (1968) established the importance of a sense of safety, it was probably the work of the late Ron Edmonds (1982) that made educators most aware of the importance of a perceived sense of safety in the learning process. At a fairly global level, Edmonds noted that students must believe the school grounds are safe; that is, they must believe they can eat lunch in safety, use the lavatories in safety, walk home in safety, and so on. For the vast majority of American schools, this level of safety has already been secured (although it remains a concern in environments where “gang cultures” have established a foothold). Students must also believe that they won't be victimized by other students in direct or indirect ways, and that if they are, teachers will immediately intervene. Unfortunately, breaches of safety frequently go unnoticed by teachers. I once interviewed a secondary teacher who was “sure” that students in his homeroom class perceived the school in general and his class in particular as a safe environment. When he asked students to fill out an anonymous questionnaire about their perceptions of safety, however, he discovered that some students in his class were practicing what amounted to extortion—demanding payment for protection. In summary, teachers need to be aware that their simplest behaviors often determine whether students feel accepted—by both teachers and classmates. And they need to be aware that they can adjust the physical environment of the classroom to make students feel more comfortable. Proficient learners believe that the tasks they are asked to perform have value, that they have a fairly clear understanding of what the tasks require, and that they have the resources necessary to complete the tasks. Teachers can use specific classroom techniques to bolster these beliefs. Of the beliefs listed above, the perceived value of tasks is probably the most important to the learner's success. Current research and theory on motivation (McCombs 1984, 1987; Schunk 1990) indicate that learners are most motivated when they believe the tasks they're involved in are relevant to their personal goals. Glasser (1981) and Powers (1973) hypothesize that human beings operate from a hierarchical structure of needs and goals: they must satisfy basic physical needs (e.g., food, shelter) and psychological needs (e.g., acceptance, safety) before being able to form goals—to decide what they are “consciously trying to accomplish” (Schunk 1990). From this perspective, working to develop a positive mental climate, discussed in the previous section, focuses on meeting students' psychological needs. A growing body of research indicates that when students are working on goals they themselves have set, they are more motivated and efficient, and they achieve more than they do when working to meet goals set by the teacher (Hom and Murphy 1985, Schunk 1985). This research strongly implies that if educators expect students to be motivated to succeed at classroom tasks, they must somehow link those tasks to student goals. Some powerful ways of doing this include allowing students to structure tasks around their interests, allowing students to control specific aspects of tasks, and tapping students' natural curiosity. Overtly gearing tasks to student interests is a simple matter of knowing what students are interested in and then linking tasks to their interests. For example, knowing that many students in her class are fans of professional basketball, a mathematics teacher might use the box scores from the newspaper to illustrate the concept of the “average.” Oddly enough, there is little research evidence indicating that teachers are using student interests, except in the area of reading instruction. Morrow (1991) notes that within that body of research, the trend is toward identifying and capitalizing on student interests, especially within literature-based instructional approaches. Allowing students to specify how tasks will be completed means that assigned tasks are relatively open-ended. For example, an English teacher might review the rules for using commas and then, as a practice activity, ask students to find examples of each rule in whatever kind of material they want to read. A student interested in baseball might use the sports page. A student interested in music might use the written lyrics to popular songs, and so on. Capitalizing on the natural curiosity of students is another way of making tasks relevant. Human beings are naturally curious. In effect, we are “hard-wired” to want to know why things happen, how they work, what the parts are, what will happen if . . ., and so on (Lindsay and Norman 1977). Teachers can tap this natural curiosity by offering interesting “tidbits” along with content. For example, I once observed a teacher present students with some of the details of Hemingway's life before she asked them to read one of his short stories. Specifically, she described how Hemingway had established a counterintelligence organization called the Crook Factory to deal with the influx of German spies in Cuba and the presence of submarines off its coast during World War II. Students were fascinated by the account and their enthusiasm carried over into their reading of the story. Fundamentally, if learners do not have a clear model of how a task will look when it is completed, their efforts to complete the task will often be ineffective. Educators like Hunter (1982) have provided teachers with strong guidelines about how to make tasks and expectations about tasks clear for students. In general, the guidelines suggest that teachers provide models of completed tasks. For example, following the Hunter guidelines, a language arts teacher who has asked students to write an essay might give students an example of a completed essay that illustrates all of the assigned criteria. Obviously, students must perceive that they have the necessary materials, time, equipment, and so on, to complete a task. These are external resources. Not so obviously, students must also perceive that they have the necessary internal resources—the “right stuff.” Contrary to popular belief, the “right stuff” is not necessarily ability. In fact, current research and theory in psychology indicate that learners commonly attribute success to any one of four causes (Schunk 1990; Weiner 1972, 1983): ability, effort, task difficulty, or luck. The first two of these, ability and effort, are key elements of motivation. Learners who believe they have the inner resources to successfully complete a task attribute their success to effort; there is no task they consider absolutely beyond their reach. Learners who believe they are good at some things but not so good at others attribute their success to ability; they perceive themselves as incapable of success at some tasks. In the classroom, teachers should continually reinforce the importance of effort and boost students' sense of their ability. Teachers might give powerful examples of how effort paid off in their own lives or in others'. Covington (1983, 1985) suggests that students should occasionally receive rewards (such as grades) based on their efforts rather than on their successful completion of tasks. Teachers can improve learning by planning ways to improve students' attitudes and perceptions about the classroom climate and about assigned tasks. Good teachers have always tried to foster positive attitudes and perceptions about learning. In a well-run classroom, many of the ways they do so seem to be simply a part of the natural flow of activity. But seemingly transparent behaviors are usually the result of conscious decisions, of teacher planning. Because attitudes and perceptions do play such an important role in learning, teachers must overtly plan and carry out behaviors to ensure that they are reinforced. To explore how a teacher might plan for reinforcing positive attitudes and perceptions, let's consider Ms. Conklin, a junior high school science teacher who has decided to develop a unit on weather. As part of preparing for the unit, she decides to write up a plan for what she will do to reinforce the first dimension of learning. Even though she's been teaching for more than ten years, Ms. Conklin has decided to make sure that she reinforces positive attitudes and perceptions during her unit on weather. She was prompted to review her methods for doing this by a videotape she recently saw of herself in the classroom during her second year as a teacher. What she noticed as she watched the tape was that she used to do some very nice things in her classes that she somehow discarded over the years. For example, she noticed that she would frequently touch students on the shoulder as she walked up and down the aisles, and she remembered that this simple action seemed to create a bond between her and the students, making them feel accepted and cared for. She decides to reinstate some of the old practices that she let lapse. Help students feel accepted by the teacher. Greeting students at the door every day will help start classes on a positive note. Help students perceive classroom tasks as valuable. Explaining how tasks might relate to students' daily lives will help students' develop a more positive attitude toward them. Ms. Conklin realizes that she must first find out what her students are interested in, but she thinks the extra effort will pay off. Help students be clear about classroom tasks. Describing how each task might look when completed or presenting models of completed tasks will help students understand what they are trying to achieve. What will be done to help students develop positive attitudes and perceptions about the learning climate? What will be done to help students feel accepted by the teacher and by their peers? What will be done to help students perceive the classroom as a comfortable and orderly place? What will be done to help students develop positive attitudes about classroom tasks? What will be done to help students perceive classroom tasks as valuable? What will be done to help students believe they can perform classroom tasks? What will be done to help students understand and be clear about classroom tasks? These questions cannot be addressed in every lesson. As Ms. Conklin's planning illustrates, only a few are emphasized in any one unit of instruction. Over the school year, though, a teacher would probably address all these questions. 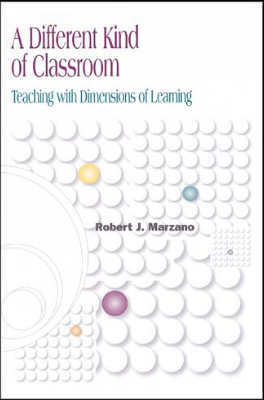 If a teacher consciously and systematically addresses one or more of the areas of Dimension 1, students will likely develop and maintain positive attitudes and perceptions about learning. Copyright © 1992 by Association for Supervision and Curriculum Development. All rights reserved. No part of this publication—including the drawings, graphs, illustrations, or chapters, except for brief quotations in critical reviews or articles—may be reproduced or transmitted in any form or by any means, electronic or mechanical, including photocopy, recording, or any information storage and retrieval system, without permission from ASCD.